Nullifire ... effective passive fire protection. Tremco illbruck Middle East has integrated Nullifire into its regional business, taking direct control of it on a local level. The move is aimed at greatly enhancing its levels of customer support and significantly reducing both response times and lead times. “Tremco illbruck Middle East is now responsible for the sales and distribution of the full range of Nullifire intumescent coating, fire stopping and passive fire protection solutions in the Mena (Middle East and North Africa) region,” says Stuart Wakeham, sales director Middle East/Africa/India for Tremco illbruck Middle East. Nullifire is a core brand within the Tremco illbruck Group and has been installed by the construction industry worldwide for more than 40 years. 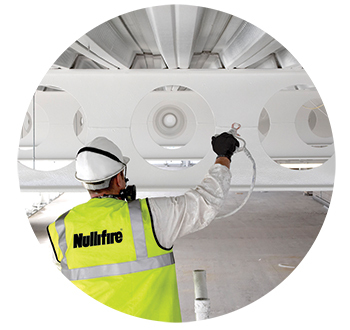 With a specialised range of intumescent coatings for structural steel, Nullifire has now further enhanced its market offering by introducing the SC900 series of intumescent coatings that can achieve a full two-hour fire rating on structural steel with a single coat application. This allows all parties concerned in the construction process to greatly reduce time taken to protect the steel as well as the obvious costs savings in labour. “The SC900 series leads the market into a new era of high quality, time-saving products to protect structural steel construction,” Wakeham comments. In addition, in keeping with its tradition of research and development, Nullifire will introduce intumescent coating SC801s to its range at the end of the second quarter. 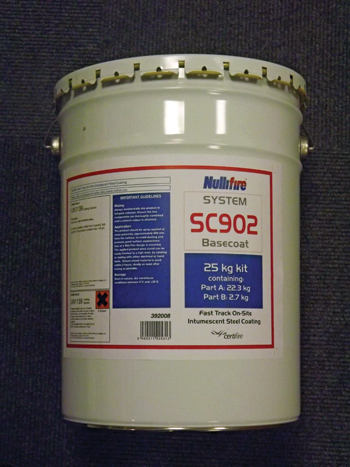 Nullifire SC902 intumescent coating for structural steel. • Safety: They are fully tested fire safety products that can be absolutely relied upon to provide the specified protection for all building users. • Speed and simplicity: It is quick, easy to achieve the reduced thickness. The coatings are easy to apply and safe in on-site and off-site application to achieve a two-hour fire protection. • Durability: They provide a long-lasting robust finish, so there are no maintenance issues that can inconvenience building users. Using widely available topcoat products, all Nullifire intumescent coatings for structural steel fire protection can be finished to a high quality decorative surface, fitting into modern construction methods to allow for pleasing aesthetics. Meanwhile, Nullifire fire stop products have been at the forefront of fire safety during the construction of new buildings and when retrofitting into established buildings. “The products are fully fire tested to the latest British and Euronorm standards and are fully CE compliant. They offer up to four hours fire rating to allow even the most adventurous building design achieve full compliance to local authority building regulations,” he says. Offering protection at the head of wall joints, expansion joints and through penetration fire stops in both walls and floors, the Nullifire range offers a one-stop solution for any construction where fire safety is paramount, Wakeham adds. Manufactured in the UK, Nullifire is fully compliant with international and local standards and is approved by the Abu Dhabi and Dubai Civil Defence authorities. Its products are readily available in stock at its new DIP facility and are fully supported locally by an exceptional technical and commercial team. “Now with local stock available, Nullifire can supply immediately, meaning no hold ups on site and, besides local stock availability, the company has also invested in local technical support, enabling the correct solutions to be offered without delay by qualified engineers. Of course, the local office still enjoys full technical support from head office in the UK,” he concludes.